I have always loved Asian art and design. 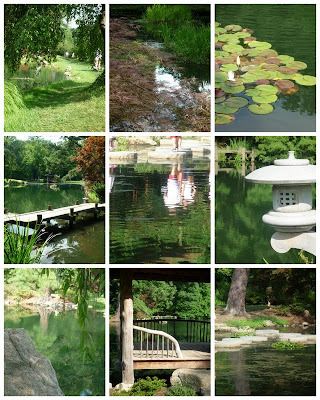 Yesterday, I was thrilled and sad to stumble across the Japanese Garden at Maymont for the first time. I can't believe that we have lived here for 5 years and now that we are moving I have found, what may just be, the prettiest spot in the City of Richmond. At least I'll have a few months to explore my new favorite place while we are in transition. I took a lot of pictures yesterday. As you can see the garden was filled with color, water, texture, and balance. Spending time there got me thinking about how that fact that although I love it, I haven't incorporated many Asian influenced items into my own home. I think what's holding me back is the fear that a room can quickly go from subtle touches to a trip to the far east. After scanning the web I found a few things that could add that touch I'm looking for without going over board. And yes, I know I am mixing Chinese and Japanese influences. 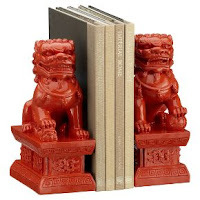 I love the bright red color of the Fu Dog bookends. 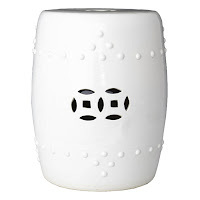 They were one of many items on the CB2 site with an Asian influence. I could also see them as part of an arrangement of interesting items on a mantle. 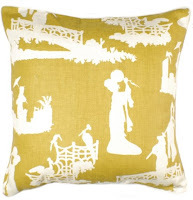 The chinoiserie pillow by Thomas Frank was found on my new favorite site Cherry and East. The green tray comes from there too. I know the tray shape and color doesn't sing Far East, but the influence can be found in the lacquer glaze. I think this white ceramic garden stool rounds out this little of collection of accessories nicely. Its crisp white color would be right at home in a modern or traditional setting. It could be used as side table, extra seating, foot rest, or simply as an object d'arte. I love the Cherry and East website. Even though I think most of the stuff is meant for kids, it is right up my alley! Thanks for a great find. Can you tell me how to make the little grouping of photos like you did at the start of this post? They are so pretty. Great job. Karen, the grouping of photos was created using Picasa, Google's photo organizing, editing, and sharing tool. Its free to download and easy to use. I created the grouping using the collage maker tool.